Bad news for all gamers in Australia. The video game retailer GAME has today gone into voluntary administration putting a risk the jobs of more than 500 employees in its 92 stores. GAME appears to be a victim of the soft general retail environment coupled with the fact that many gamers now buy titles from overseas stores for much cheaper via the web - or directly from publishers as a digital download using services like Steam. Other more casual gamers are increasingly moving to cheaper game apps that they download through their smartphones and tablets. So what will happen to GAME from here on? We are not sure as of yet. However, right now GAME has an appointed administrator PricewaterhouseCoopers (PwC) which states that GAME will continue to trade on an "as close to business as usual" basis while PwC gets a "clearer understanding of the current state of the business". Shakugan no Shana is one of the few anime that manages to incorporate action, comedy, fantasy, romance, school, super powers, and supernatural genres into one awesome series. It is definitely an exciting anime to watch whether you are a action or sci-fi fan. Not long after he enters high school, Sakai Yuji’s normal days come to an end. He sees something bizarre on his way home: people are frozen in a strange fire, and a monster that looks like a large doll is attacking them. Just when he's about to be killed, a girl in a dark cloak wielding a large sword appears, and slices the monster in half. Although Yuji survives the strange encounter, the girl informs him of a desolate truth: "'You' don't exist anymore." Shakugan no Shana has been an enjoyable experience from start to finish. I was sceptical at the quality of the story at first, but in the end, it was beyond my expectations. Unlike other similar anime to this one, Shakugan no Shana tries to break free from the traditional action/adventure genre by incorporating elements from fantasy, romance and comedy into scene. You might think this is going to be one messy anime, but I can assure you that it is not. This series introduces us to the main characters and how Sakai Yuji discovers who he truly is. From then on, he develops a complex love-hate relationship with the girl (Shana). Yuji also discovers he has a "Mystes" (or special treasure) inside him which leads to many other Flame Hazes wanting to take the treasure for themselves. So it is up to Shana to protect Yuji from harm. The story was engaging and entertaining right from the start. There were a few details that were left out, but most of them are answered in the sequels. The art was simply stunning throughout this anime. The battles were fierce and the variety of different monsters were just intriguing. The special effects on the various super powers that the characters possess is just exhilarating to watch them play out. The originality is certainly there and the surroundings never looked better. Even the "Fuzetsu" had its own unique art style that clearly differentiates the different dimensions. Shakugan no Shana provides us with a catchy opening and ending songs that seem to not want to leave my head. The music suited the anime excellently and the various ambient, sound effects, and background music were all well composed. The voice acting was perfect and suited the represented characters perfectly. It took a few episodes to realise that the voice actor of Shana did Torodora! as well. I could see the resemblance between to the characters as they are both short, have long hair and totally tsundere. Whilst on the topic of characters, Shana was just perfect. Having a tsundere main character is just pure entertaining (for me). I seem to have a liking for tsundere characters. Anyhow, moving on to Sakai Yuji. He may seem useless and hopeless at first, but he comes to an understand to who he is and what he must do. If you have watched the entire series already, you may know what I mean. For those who havent, just remember that this series is just the beginning of a chain of events that will change Sakai Yuji's life (for better or for worse). The other characters also play an important role for future events whether you like it or not. Margery Daw and Wilhelmina is probably my two favourite characters in the whole series and you probably can understand why after you watch it. There is a huge variety of characters in the anime and there's even more to come. Overall, I really enjoyed the anime. It was fast-paced, contained lots of action, hinted at some romance, with plenty of laughs. The story has some plot holes, but will be answered in the sequels to come. The character themselves are charming and the theme songs are catchy. 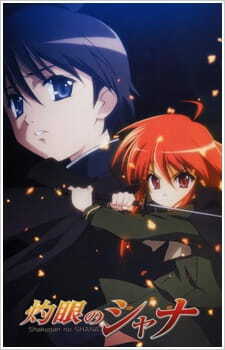 If you are a dedicated action, sci-fi, super power, or adventure fan, give Shakugan no Shana a go. There is plenty of sword-play and awesome super powers to be witnessed. A great story needs a good beginning and Shakugan no Shana provides just that. Battles were amazing and the animation was fluid. Scenery was great! Catchy theme songs along with perfect voice acting. The characters were well developed. However, there are more to come in the sequels. It was fun, exciting, and enjoyable to watch. Definitely recommending this anime to another that likes the mentioned genres of this anime.